Blending creamy sweetness with a pleasant salty crunch, this pretzel gift includes both yogurt-covered pretzels and chocolate-covered pretzels. The rich yogurt shell adds a subtle tang to these crispy pretzels. 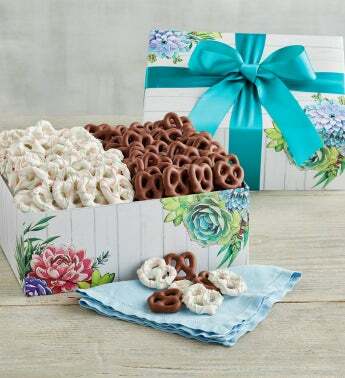 The chocolate pretzels, on the other hand, are thickly coated with the same milk chocolate we use in our signature chocolate truffles, making these pretzel treats a delicious spring snack.